SAN NARCISO, Calif. (Bennington Vale Evening Transcript) -- On Tuesday evening, Senate Majority Leader Mitch McConnell invoked an arcane parliamentary procedure, Rule 19, to silence Sen. Elizabeth Warren (D-Mass.) from protesting Jeff Sessions’ imminent confirmation as U.S. Attorney General. Warren, a known rabble-rouser in Congress, agitated Sen. Steve Daines (R-Mont.) thirty minutes before, while he was presiding over the Senate, for which she received a stern warning about impugning a colleague. Warren did not attack Sessions’ reputation directly; she instead read from an impassioned 1986 letter, written by Coretta Scott King to the Judiciary Committee, calling on members to oppose Sessions as a federal judge. The success of Rule 19, now referred to by the Trump administration as the “putting uppity harpies back in their place” maneuver, has inspired the president to ask acting Co-President Bannon when he can execute Order 66. Sessions’ testimony, Senate leaders clarified, actually demonstrates an abiding dedication to making America pure again. He clearly believes in the reduction of government oversight to bolster states’ rights, including repealing Amendments 13, 15 and 19. He wants to erode racially charged fringe groups that keep Americans divided by claiming that some lives matter more than others. He wants to restore the Constitution to its original grandeur, a time before activist courts perverted the sacred document by altering its intent with immoral legal decisions that destroy family values and unborn lives. And he inspires a renewed sense of urgency in fighting the protracted war on drugs. Given this impressive list of accomplishments, Republicans rallied behind McConnell and Daines when they moved to vote for stifling Warren’s speech, and then officially prohibiting her from addressing the topic of Sessions again. NPR, in covering the debate, explained Daines’ rationale in citing Rule 19. The impetus came from the perception that Warren had called the sitting senator a “disgrace to the Department of Justice.” Warren emphasized that she was not stating her opinion but reciting the words of Coretta Scott King and the late Sen. Edward Kennedy (D-Mass.). Although other Democrats tirelessly reminded the committee of Sessions’ abysmal record on upholding the rights of minorities in his community, and stressed that he was denied a federal judgeship because of this dreadful legacy, McConnell defended the decision to single out Warren for her fiery tirade. Donald Trump and acting Co-President Steve Bannon monitored the Warren situation closely throughout Tuesday night. Although rarely activated, Rule 19 perfectly achieved its desired ends. For Trump, the procedure also proved to be an important milestone in the evolution of his policy strategy. Rule 19 essentially validated the ability of GOP legislators to suppress dissenting voices across all quarters of the nation, including its governing bodies. Trump officials realized similar successes in January when they persuaded law enforcement agencies to charge peaceful protesters, and journalists covering those demonstrations, with felony rioting -- violations that bring $250,000 fines and 10-year prison terms. According to leaks from White House staffers, the encouraging results prompted a bizarre response from Trump, who asked Bannon when he could execute Order 66. Members of Trump’s cabinet admitted they had no idea what Order 66 was. The confusion was cleared up by an anonymous member of the White House maintenance staff. Order 66 was an event at the end of the Clone Wars in which the clone troopers of the Grand Army of the Republic turned against their Jedi commanders and terminated them, bringing about the destruction of the Jedi Order. The event was triggered by Clone Protocol 66, an order implanted into the clones by the Sith Lords and Kaminoan scientists who created the clone army. The protocol caused clone troopers to violently lash out at the Jedi and view them as traitors, and were controlled by a bio-chip implanted into the clones during their creation; the chip could control the behavior of the clones and ensure total obedience. Trump, more unhinged and disheartened recently, allegedly perked up and spoke gleefully with Bannon about the potential of Order 66. Bannon, one source confirmed, also approved of the concept. With Order 66, Trump and Bannon could effectively trigger a waiting militia of citizens to assist with deposing the journalists, political opponents, civil rights advocates, judges and un-American critics who want to disrupt Trump’s bold plans to bring America back to the majesty of its 18th century roots. Bannon, after viewing the “Star Wars” film with Trump, also suggested providing new uniforms for the clone army, based on the appearance of the fictional Stormtroopers in Lucas’ space opera. 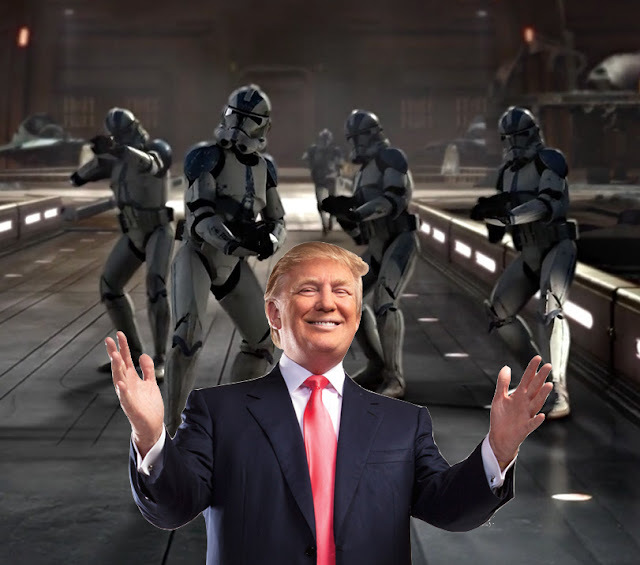 Not only does Trump’s consideration of implementing Order 66 mark the first time a sitting president has aggressively pursued the idea of implanting mind-control devices in civilians, it also denotes the first time an authoritative figure has acknowledged any relevant or praiseworthy aspects of the “Star Wars” prequels.